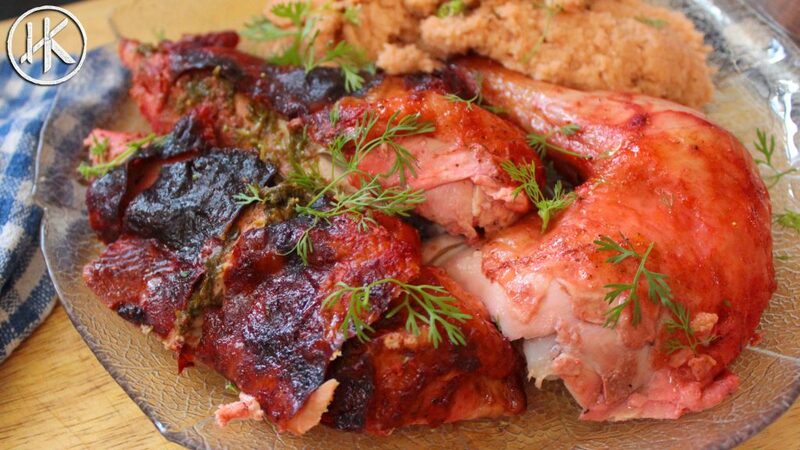 Tandoori Roast Chicken - Headbanger's Kitchen - Keto All The Way! It’s another easy Keto recipe video here on Headbanger’s Kitchen. My last recipe was a super delicious Thai style Keto fried rice and I thought I should do an Indian dish to wrap up the easy Keto cooking week. I did wonder though, can I make an Indian dish with just 5 ingredients and make it taste delicious? Indian food has a lot of layers and spices, unlike say Italian cuisine which is a couple of ingredients of the highest quality which make great dishes. Challenge accepted. Which is why Tandoori chicken made perfect sense. However I wanted to make it a complete meal and I wanted to keep the fat macros up. 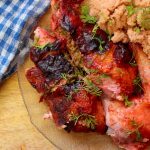 So I came up with this easy Keto tandoori chicken recipe that is sure to impress and leave you wanting more. Enjoy! If you ever find a tandoori chicken with skin on it, let me know. Chances are you’ll never find one. Indian cooking typically never includes the chicken skin and in general. For a typical tandoori chicken you would have a skinless bird and you’d score the flesh to ensure the marination penetrates it very well. I chose to mix Indian flavours with the typical roast chicken style of cooking. My tandoori compound butter goes under the skin to flavour the breast meat and also keep the bird moist. Marinating the chicken overnight allows the flavour to seep right in but also allows the skin on the bird to dry out making it super crispy at the end. The low and slow cooking ensures a well cooked bird. Though if I am being honest I always felt roasting a full chicken is not the best way to cook it because of the fact that breast meat cooks much faster. I generally prefer to cook them separate or if I must I do spatchcock the bird for a more even cooking. As I mentioned in the video, my original idea was to roast the cauliflower and just eat it as is. However as the dish progressed I realized I made too many mistakes and it didn’t taste very good. Just throwing in cauliflower and giving it a week bit of seasoning and randomly pouring marinade over it doesn’t quite cut it. So I blended the roasted cauliflower with the resting juices, the pan juices and made a lovely mashed cauliflower. If you do want to roast it I would suggest giving it a nice coating of oil, salt and the tandoori masala. That will really bring out the flavour. You can also just skip the cauliflower and roast any other veggies you like with this. Personally I’d go with asparagus and mushrooms because I love those. Either way always give the veggies a good rubdown and show them some love too. Otherwise they will be devoid of flavour. 1 Chicken The whole bird!!!! Give the chicken a good rub down with the marinade making sure you've got the entire bird covered well. Leave it overnight in the fridge to marinate. Mix the butter, coriander and remaining tandoori masala together and stuff under the chicken chicken over the breasts and legs. Roast the bird along with the cauliflower at 150 C for 2 hours for a smallish bird and 160C for a bigger bird. I would recommend giving the cauliflower a good mix with some olive oil, salt and tandoori masala as well so it's more flavourful and roasts better. Once roasted, carve the bird and eat it. You can eat the cauliflower as is or you can set it aside, reduce the roasting pan juices and then blend with the cauliflower to have a delicious cauliflower mash. Please would you include the quantity of cauliflower to use? I made a version of this using skin-in, bone-in chicken thighs and it was absolutely gorgeous! This only needed 30 minutes in the oven and was demolished by two very hungry people over two days 🙂 We used some of the leftover drippings in the pan to make a quick cauliflower side (coarsely chopped cauliflower, drippings, coconut milk), and saved the rest of the drippings for scrambled eggs during the week. The combination of tandoori masala, chicken fat, and marinade makes these scrambled eggs incredible, making this a recipe that keeps on giving! You can use as much as you like Raj. So maybe 500grams should be enough cauliflower to go with 1 bird.